Carry your camera around your neck or in your hand. 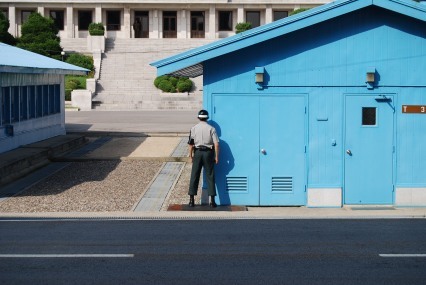 You cannot have anything bulging out of your pocket, or else the North Korean soldiers can think it is a bomb. At the border, I could physically feel the tension between the two nations. 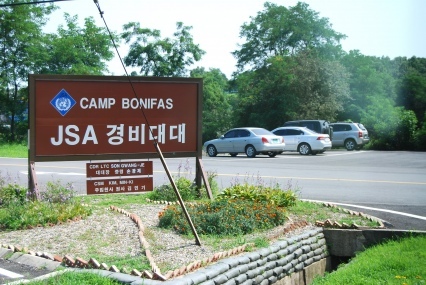 It felt that either nation was completely prepared for war at any moment. 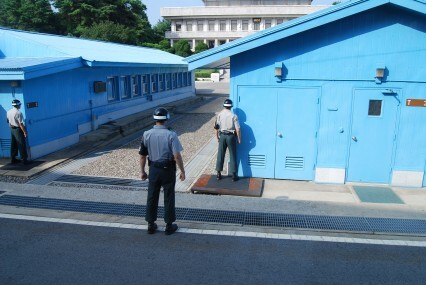 South Korean guards stood behind each other behind the blue houses, gazing into the distance of North Korea. 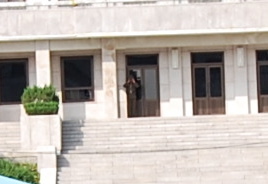 Meanwhile, you could see a North Korean guard hide behind a pillar, and observe South Korean activity with their hi-focal binoculars. The border was eerily quiet, and I felt as if I was looking at a snapshot of the nation’s history. The rest of the world has moved on, yet everything here was stuck in a complete standstill. 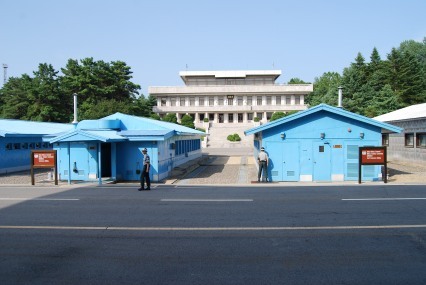 We later entered one of the conference rooms (the little blue house on the left side). Inside the middle of the building, there was one conference table with three small black microphones. 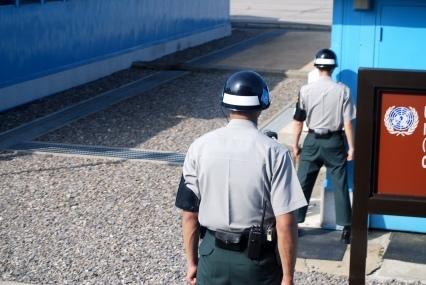 Not only did the microphones record all conversations, it also marked the 38th parallel. 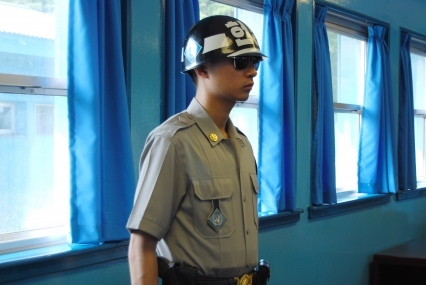 The South Korean soldier allowed us to pass these mics, as long as we did not go out the door on the North Korean side (there was a guard there anyway). I think that moment was very bittersweet: I felt free yet trapped at the same time. 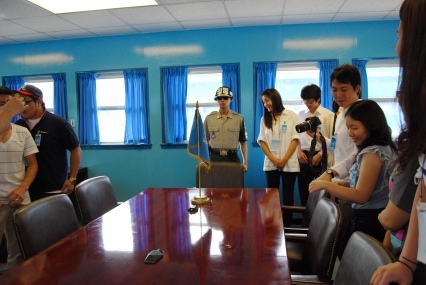 Free because this was probably the closest I’ll get to North Korea in my lifetime, yet trapped because while it was so simple to just walk across the room, it isn’t as simple to amend the differences between the two nations. 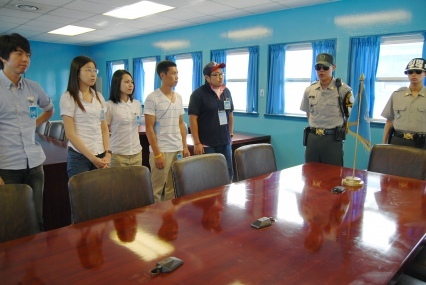 Our group, formed by the Ministry of Unification, was very multicultural as it included not only students from America (Wellesley & BU), SangSaeng Reporters, & Kyungwon University, it also included some North Korean defectors. While we were heading back to the bus, I heard them say: “Oh! We have now been spotted by our gwn government haha!” While I know they were just joking around, I felt so distraught mainly because I would never have even the closest idea of how they felt. I could never imagine being banned from my own home, nonetheless being able to look back at where you used to live life. It took a lot of guts to do what the defectors did, and laughter only helped them get by on how they truly felt. 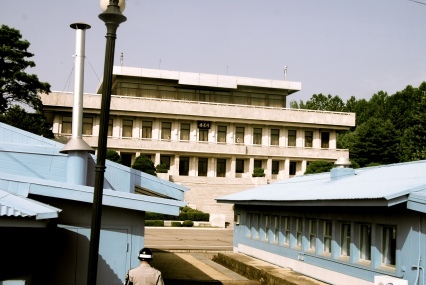 This entry was posted in Articles and tagged 38th parallel, grace kwon, JSA, kyungwon university, ministry of unification, north korea, panmunjeom, panmunjom, panmunjum, south korea by gkwonn. Bookmark the permalink.